If sparklers are the most dangerous type of pyrotechnics you’ve ever dabbled with, it’s time to up your game with a homemade flamethrower that brings even more spectacle to your next backyard BBQ with rainbow-colored flames. 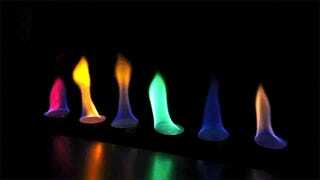 Taking advantage of the same science that makes fireworks displays so vibrant and colorful, YouTube’s The Backyard Scientist has created this relatively safe tutorial that relies on methanol and other more common ingredients. The most dangerous part of the project involves cutting open a lithium AA battery to produce deep red flames, but since you will be playing with fire, it certainly won’t hurt to use a good measure of caution with every step. If successful, you’ll have a great way to impress dinner guests with more than just your grilling skills. And if you’re not, you’ll probably still enjoy a modicum of YouTube fame if you manage to get the results on camera.